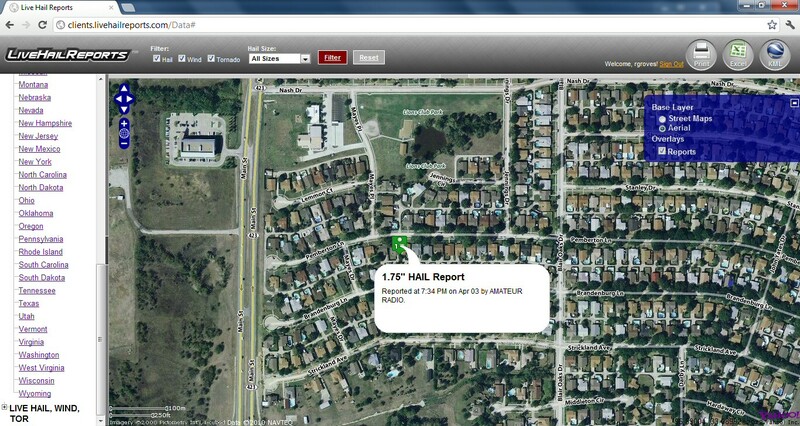 LiveHailReports.com’s updated website offers users a suite of new hail damage tracking tools and provides unlimited hail reports for one monthly price. All plans include access to the live hail tracking map while upgraded plans include enhanced hail damage tracking features including hail alerts via email and historical hail maps. SWIFT Weather offers incredible value by providing unlimited hail reports for one low monthly price instead of charging for each hail report individually. "We’re excited to offer our newest hail storm tracking products and live hail reports to contractors,” said SWIFT Weather CEO Rory Groves. The award-winning weather software developer, SWIFT Weather, today announced the availability of their new hail storm tracking products on LiveHailReports.com and the introduction of unlimited access to hail damage reports. The three subscription plans – Standard, Plus and Pro – allow users choose the hail tracking features which meet their exact needs. Depending on the plan selected, users can review hail damage patterns using real-time hail reports for any state in the country; obtain access to a vast historical data archive, hail damage reports and maps, and aerial photography. Live Hail Reports is a must-have for contractors or anyone who repairs hail damage and needs to get to the worst affected areas first. “We’re excited to offer our newest hail storm tracking products and live hail reports to contractors,” said SWIFT Weather CEO Rory Groves. “We believe we are offering incredible value by providing unlimited hail reports for one low monthly price instead of charging for each hail report individually,” concluded Groves. Live Hail Reports’ Standard monthly plan for $79 per month is ideal for growing businesses. It lets the user monitor real-time hail activity in one state. The Real-Time Hail Tracker provides access to hail damage reports as they happen over an interactive street map – giving a contractor the best chance of getting a job before their competition. Also included is the Daily Hail Summary showing nationwide hail damage for the previous day with intuitive infographics and precise hail information delivered to the user’s inbox every morning. The popular Plus plan for $129 per month includes all the features of the Standard plan, but lets the user monitor wind and tornado activity in up to five states. In addition, the Plus plan provides access to detailed historical hail maps with street-level thumbnails in any metro area going back one year. The Pro plan for $199 per month gives the user unlimited access and the ability to monitor weather activity in all 50 states. The Real-Time Hail Tracker, Wind and Tornado upgrade and Daily Hail Summary products also are included. There are printable, detailed Historical Hail Maps going back five years with street-level thumbnails in any metro area. 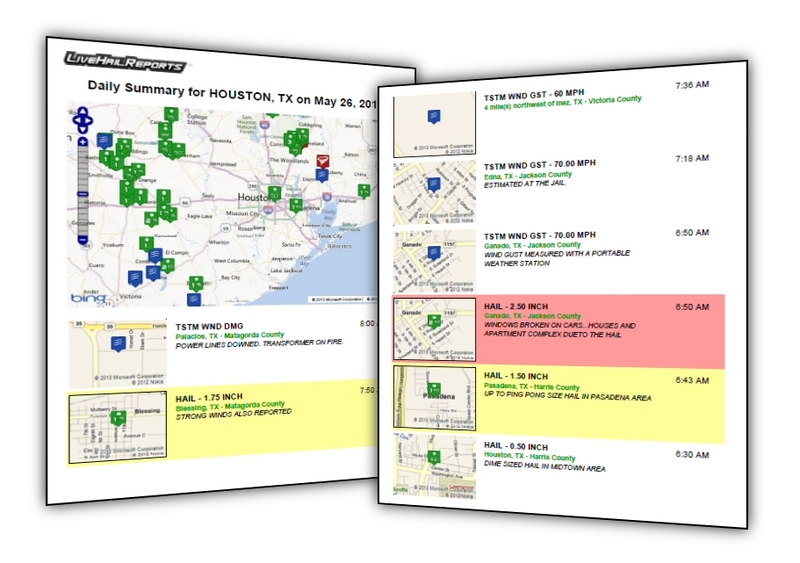 As an added bonus, Pro plan users receive Real-Time Hail Alerts with street-level detail delivered to their inbox within minutes of hail damage occurring in any state of their choosing. Visit http://livehailreports.com/ for more information or to sign up for the Standard, Plus or Pro plan. Live Hail Reports is a must-have for contractors or anyone who repairs hail damage and needs to get to the worst affected areas first. All plans include access to the live hail tracking map while upgraded plans include enhanced hail damage tracking features including hail alerts via email and historical hail maps.